The therm of “repatriation” is not completely valid. From 1992 to 2004, many christian orthodox families came from the former Soviet Union, labeled us “repatriated greeks”. These people where mainly mixed families of christian orthodox Pontians of Caucasus area. Their families were mixed families of russians, georgian, and pontians, mainly using Russian as lingua franca. 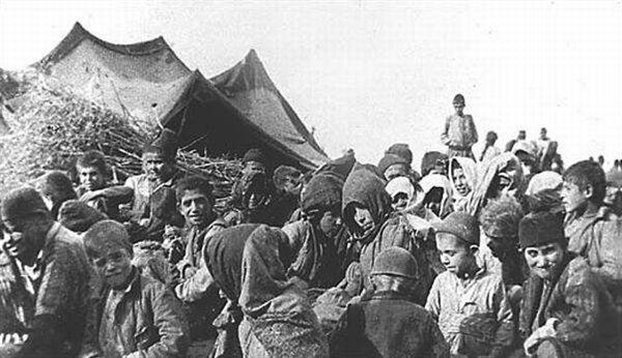 Even though these people were taged by the greek state as repatriated greeks, none of them had ever been before to Greece. Also they did not have any knowledge of greek language. Only a 30% of them had a full or some knowledge of the greek pontiac language, which is of course of greek origin, but it is very distinct from modern standard greek and not mutually intelligible. Now all these peole consist the Russian speaking communities in Greece, especially in north Greece and Thessaloniki. The imigration movement continued, in smaller numbers till 2008. Now, in 2013 the Greek state argues that the pensions that the elders of these people were recieveing, are going to stop. Considering that for many of these families the pensions were their only income, now with the current rate of unemployment, the pension suspension is a big issue. For 20 years these people had the worst jobs, and they were in a hazy legal status.But this hazy legal status provited them with a small pension of 360euros . Now they are loosing that. Within the general devaluation, pensions , allowances and access to health, decline. Recently there has arisen an important issue with OGA pensions of ” repatriated ” greeks and is announced that the pensions will be suspented at the end of September of 2013. That announcement has mobilized all people from the former USSR and their families, as many of these families rely to a significant extent in these pensions and some of them entirely to them. The issue is not simple and yet remains a low priority for the movenet in greece . Repatriated people for many years incorporated the national ideology, and although their material reality – at least initially – was that of an immigrant in a foreign country ( they did not know the language , poverty , etc.) themselves ideologically joined in contemporary Greece , and supported it with all their forces , both in terms of labor force ( a very undervalued labor power for the status of 90 ‘s) and ideologically – we even had greek olympic championers from USSR who they didnt even know the language….and beneath them the crowd with the Greek flags were moving hysterically ! The state then started offering them OGA pensions of 340e . The urgent need to sell their labor power at a competitive price when they first came to Greece , the artful retention of them by the Greek State to the level of an unskilled laborer , integrating the national body ( through specific policy of the state, through education and legal frameworks ) and their dislike for anything ” communist ” and ” left ” in appearance, was the ideal mix to continue to work as relatively undervalued proletariats (the rise of the economy to a large extent, especially in northern Greece was based on them ) and to keep them away both from any “native” labor struggle and also the struggles of immigrants , the state created the intermediate state of being of “Repatriated greek”. They were neither natives nor immigrants. The struggles of the locals were not of they concern – as the gradual and short-term fluctuations in the value of labor power of the locals worked to the benefit of russian speaking immigrants, they were more competitive – and the struggles of immigrants did not also concerned them, they were not living like all other immigrants , they had a basic access to public health ,didnt have issues with ” papers ” documents etc. The change in status of ” repatriated greek” initially through cuts OGA clearly falls within the general framework of necessary devaluation of labor power and get rid of pensioners who do not ” create value ” , thе suspension of the special ” status ” of repatriated greek ( already they started to discuss of reviewing the ” Georgians, Armenians etc ” who came ” together” with “our” immigrants ) and stepwise follows the equation with the ” regular ” immigrants. It makes sense repatriates to be hit by the state as they are ” orphaned ” from any interface with any movement and are completely inexperienced about any movement and they are also alienated from others immigrants. On the other hand, the connection with any left(ists) seems difficult or impossible due to historical reflexes against the Soviet Communism . In this context, the reaction of the returnees are of three directions that are sometimes intertwined . a) Mass but mostly unorganized protests in Thessaloniki (where the Russian-speaking community is the second biggest community in the city after the Greeks) -their main request is the non- elimination of pensions using as a basic argument the inelegant ” We are Greeks and this treatment is not possible .” Reflex integration in the national mainstream and faith that in previous years – of whatever prosperity -this prosperity was a direct result of the inclusion in this mainstream ,this creates this overstressing of national identity . They demand treatment as “greeks” while implying that devaluation should aim somewhere else , in some “others”. So their struggles are shooting ” blanks ” mostly because they require something by using an argument something that initially for Capital no longer has any significance: there are other necessities of accumulation now, while in the second row are separated again by the other immigrants by overstressing their “greek identity”. So b ) Some of them are driven in the golden dawn, fascist party, cause they see it as a community affirmation of national integration – confirmation moral and material. Τhere, they are given the way and the possibility to transfer the devaluation on some ” others” who are not like “us” and c ) driven massively in the ghetto and the mafia and in other dark areas of the economy , drugs, prostitution etc something with obvious implications for ” a movement prospect ” of them. PS . after so many years KKE members(members of the Communist party) who back then at 92-96 approached repatriates and tested whether they were party members in the USSR or not, promising them that they would be ” suited ” to some low payed job , they should think very well what role they did played in the whole story , and also, now that these people have problems again, what they are doing?